If you're lucky enough to have the day off (like me), perhaps you've been checking out the fine (right) daytime TV offerings that we all normally miss while slaving away at "real jobs." I was able to catch a classic Good Deal rerun on FN with Dave making some baked bolognese and other pasta dishes (all of which are in his latest cookbook). He was still a little rough in this episode...fumbling his lines and such, but I really think he could have had (and I guess still could have) a great television cooking show if the time was right. Oh wellllllll. I also randomly caught Mario Batali's segment on the Martha show. I never watch her show, but was excited to see him on. 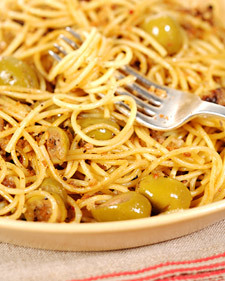 He made this yummy sounding spaghetti with green olive sauce. So simple and fresh. I kind of missed out on the Mario phenomenon (in terms of his FN career) since I didn't really start watching in earnest until close to the end of Molto Mario, but after watching this segment I was reminded just how good a television personality he really is. His demo was effortless but not lethargic. He was able to teach simple cooking lessons without being pedantic. Yes, he did throw in some big, multisyllabic words here and there, but they weren't overdone. While it's pretty clear that his time hosting a cooking show on FN is done for the time being, it's still obvious that he's a great talent. I'm totally stoked about his PBS show with Gwenyth Paltrow in Spain (as I've mentioned before). And that's not just because I've eaten chipirones en su tinta (squid cooked in its own ink) while in Bilbao, España. Have a great day off (If you have it off) everyone! While we're on the subject of FN stars, would-be stars, past stars and should-have-been stars, does anyone know if Amy Finley's "The Gourmet Next Door" will be renewed? I've been wondering about Amy, too. Something tells me it doesn't look promising for her :-( . FN dropped the ball on her show and didn't do that great of a job promoting her show IMO.